ROAD TOWN, Tortola, VI – Since the passage of Category 5 Hurricane Irma, many persons throughout the territory were left homeless and are currently residing in shelters across the Virgin Islands. However, it was reported that a number of shelters have been asking persons to leave with nowhere to go, although this news site could not confirm this information before publication time. 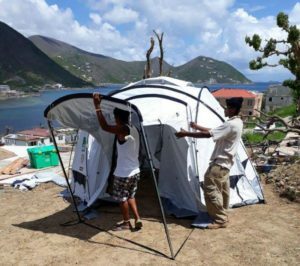 The first Shelter Box was installed Friday October 13, 2017 in Frenchman’s Cay. 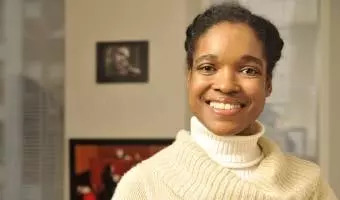 In an interview with Peta-Gaye R. Lewis, a single mother of three, she stated that she saw a picture of the shelter box and thought it was a “good idea” but needed more information on how it would actually work. “My first thought when I saw this small thing was that if myself and my three children can fit inside and where is the bathroom? Also, how would we eat in terms of if food would be provided or we would have to find our own food,” while noting that a lot of questions need to be answered. Speaking with another resident, who is currently living at the Multipurpose Sports Complex and wished to remain anonymous, they commented that the government cannot allow people to live in tents indefinitely. “Personally, you not going to see me living in a tent for God knows how long. The government need to work on helping people to fix up their houses. Look how much supplies I see coming in this place and I notice them just sitting there collecting dust. This is crazy. This is nonsense,” said the frustrated resident. Meanwhile, Deanna M. Grant told our news reporter that living in a tent would be a “new experience” for her. “I have never been camping and living in that tent would be like camping for me. I don’t know if I would want to stay in that for too long but I guess it will have to do if they run me out the shelter,” explained Ms Grant.